Tonight in Boulder, Colorado, Team Garmin-Cervelo is launching their new team for the 2012 season. We'll be at the team presentation ("Gala") at the Boulder Theater tonight. Hopefully I will have stories and photos to share from the event. Tonight's event reminds me of the Garmin-Cervelo's short sleeve skin suit I saw at Interbike this year. That marvel of a suit which debuted at the 2011 Paris-Roubaix, was timed perfectly to coincide with the big win by Johan Van Summeren - who wore the suit. The 1-piece zip skinsuit was designed for road races and was developed by Castelli, or Garmin-Cervelo Team Manager Jonathan Vaughters, it is a bit unclear. It seems the process of product development is a growing controversy. 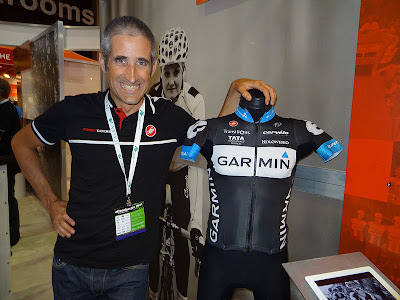 Castelli - the manufacturer of Garmin-Cervelo's short sleeve skinsuit. It was announced yesterday that Craft will again be providing cycling apparel to Andy and Fränk Schleck. Notice how I did not mention the team name, but the rider name (yes, Frandy is one rider). That is because Craft (a Swedish clothing manufacturer for biking, running, and nordic skiing) worked with Andy and Fränk when they rode for Saxo-Bank. Bjarne Riis, team manager of Saxo-Bank, watched the skinsuit that the team helped Craft develop for Saxo-Bank walk right out the door on the backs of Andy and Fränk when the brothers in turn joined Leopard-Trek. Andy and Fränk will continue wearing those Craft designs as they walk onto their newest team - Radioshack-Nissan-Trek in 2012. So where does loyalty lie, and more importantly who owns the design rights? Is it the team manager, the rider offering feedback and promoting the product, the team, or the manufacturer? What if Castelli had abondoned Garmin-Cervelo and followed Thor Hushovd to BMC and carried all the design efforts of Jonathan Vaughters right along with them? Okay maybe not the best example, since BMC uses Hincapie clothing (the company run by George's brother Rich), and George rules the roost, but the point is a curious one. Every year when ProTeams shuffle configuration, more is at stake than the simple (yet devastating) transfer of riders and rider points. Sponsors leap teams, abandon or change, equipment is recombined, product spokespersons change, team and clothing logos are revamped, and the question of intellectual property and product design credit grows murkier. Possibly the fastest bit of clothing ever created for road racing. Yes, Dave Zabriskie sang: Recommended viewing: Dave Zabriskie sings!